Ever since the 2017 general election, when we ran the Progressive Alliance campaign and Britain narrowly missed out on the prospect of a progressive coalition government, we have been thinking and deliberating about how to bring about real political change for a society that is both highly networked and highly polarised. 45º Change by Neal Lawson identifies the potential for change – the seeds of a Good Society – present in communities and organisations everywhere. The publication urges politicians and civil servants to recognise the energy and the ideas that people have developed, and to help them grow and spread. 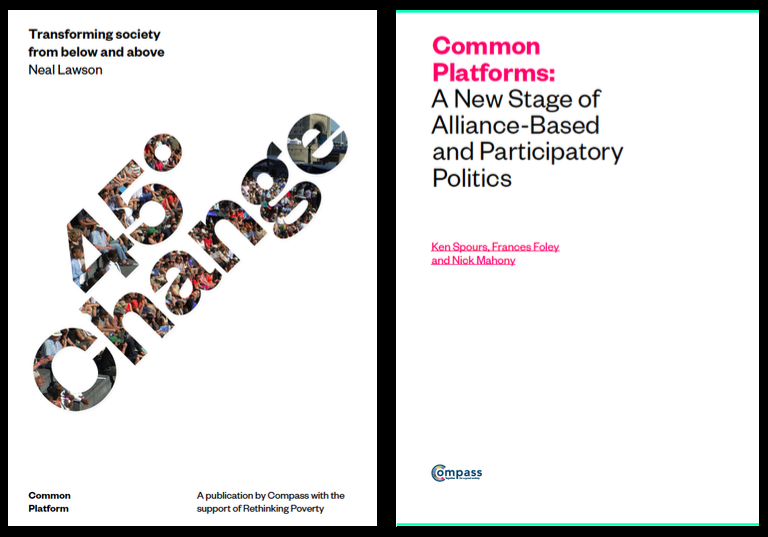 Common Platforms by Ken Spours, Frances Foley and Nick Mahony looks at the political context, noting that alliance-based politics are a requirement for any left and/or progressive bloc to gain political power. They identify ‘common platforms’ as a way to develop and sustain political alliances. We would love to hear your feedback and ideas on this thinking. Please use the comments section below to let us know your thoughts, questions and ideas in response to our recent publications. How do you think meaningful and lasting political change can be secured in 21st-century Britain? This is a disappointing start. The baseline document grounds its start point in Brexit and also posits Brexit as a ‘right wing’ conspiracy. This will lead to more credulous social democratic artifices as is the Old and New Labour way. The ‘many’ have been gorging for 40+ years on the growing neoclassical turn that started with Old Labour and IMF capitulation / suppression of shop steward led activists. The crisis is grounded in the failure of the wage relation and private property as a basis for social relations. It is this that must be challenged. If we must academise it then take the long neo-Gramscian road favoured by the credulous and yes offer a transitional programme. If however it does not involve challenge to the wage enslavement of working people and the degradation of social capital under all governments since the mid 1970’s then this is merely new narrative for old argument. 1. Bring in proportional representation. I am heartened by these publications, and by the meeting on April 6th, because at last there seems to be a way to bring together the myriad dynamic and creative initiatives that I see everywhere (except in party politics as currently practised) – in order to move towards the ‘Good Society’. You are correct in noting that the breakdown in representation is not just because we don;t have PR. We are supposed to have a ‘representative’ democracy but the single-member FPTP system means that we have only ‘half a democracy’ – on average, the member elected to represent a geographical constituency has been elected by only half of the voters and sometimes much less. Most PR systems overcome this in a way by electing representatives via party votes.That does nothing to improve the representative aspiration, especially if you, as a voter, don’t care much for the direction your chosen party is taking. The Single Transferable Vote system allows a high degree of proportional representation in the party sense, but more importantly it retains the link with the member. It is robust against boundary manipulation and it allows the voter to influence the direction a party is taking by ensuring that those who are elected for a given party are the ones selected by the voters and not those selected by the party hierarchy or ‘the faithful’. STV is in a category of its own and should be distinguished from other PR systems.